Update - Lillie has been offered a place at one of the wonderful rescues we work with! We would like to thank the generous supporters who donated to her fund - we will be contacting you shortly to return your donations. 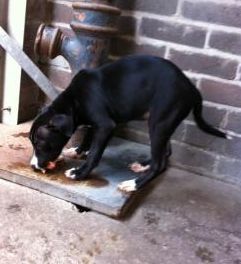 Please meet Lillie, a very cute and friendly Staffordshire Bull Terrier puppy. Isn't she gorgeous! Poor Lillie found herself abandoned at 12 weeks old and was taken to the Stray Dog Kennels where no one came looking for her. All Lillie's brothers and sisters were probably sold and when no one wanted her she was cruelly abandoned to her fate on the streets. 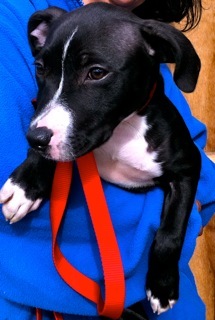 Lillie is a typical happy go lucky sweet puppy - with some wobbly back legs! It doesn't seem to bother her at all though - have a look at her video. She was also overlooked at the stray dog kennels and was due to be put to sleep until another rescue alerted us to her plight - we stepped in to try and give this little cutie a chance of a future. She is currently safe and we are looking for a rescue space for her - but before we ask any of our lovely rescues for help we need to try to find out if we can what exactly is causing her wobbly gait and and what the prognosis is. We can then see if any treatment is required to get her well again. She has already seen the vets for an initial once over and they have advised that she is in no pain but needs a CT scan in order that we can see what is going on with her legs and spine. We would really like to give Lillie the chance for a bright future in a loving home where she will be given the love and family she deserves after her tough start in life. The first part of this will be being able to get her CT scan done so that we can then find her a rescue space confident that we can pass on the results of the tests and she can continue any treatment. We are trying to raise the funds to be able to get Lillies scan done but due to the ever increasing number of dogs we are being asked to save we are hoping to be able to raise some extra funds from our loyal supporters to help little Lillie. 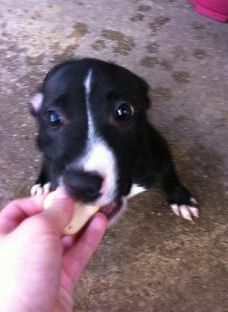 If you would like to help us with Lillies vets bills it will help us hopefully secure this girl a happy ending. We thank you for taking the time to read Lillies appeal and hopefully will have some updates for you soon!